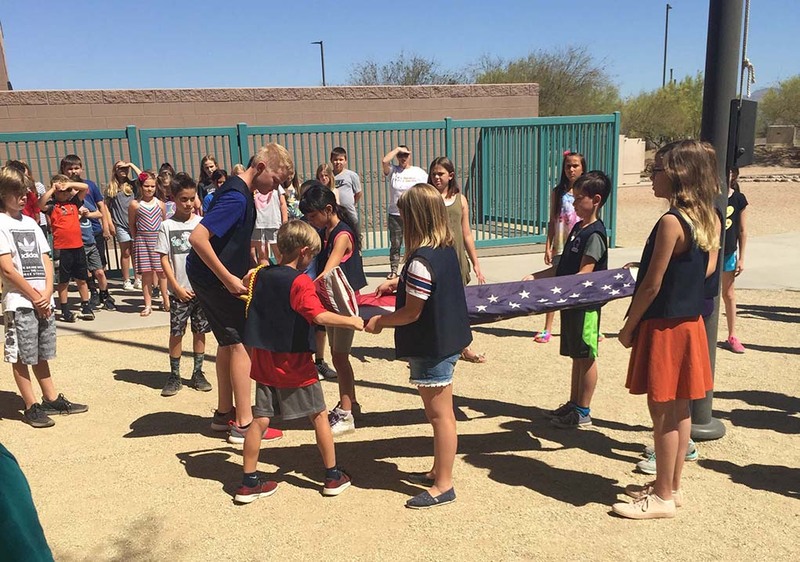 Horseshoe Trails Elementary School, located in the Cave Creek Unified School District, has a Flag Corps club led by Ms. Deb Feibus, 4th grade teacher. The club has parent volunteers who wear “Proud to be a Flag Corps Parent” lanyards whenever they assist and attend Flag Corps events. The students hope to model proper flag raising and lowering etiquette while observers have the opportunity to learn and honor the flag. The students wrote a guide that is posted on the HTES website. The club was initiated by interested 4th grade students in January 2017. The Flag Corps club has a set of parade flags and harnesses. They are eager to share their expertise and knowledge with the community. Horseshoe Trails Elementary School is an A+ School of Excellence offering its students Chinese Immersion and on-site Horsemanship and Equestrian programs. For more information, contact the principal, Dr. Matt Schenk at 480-272-8505 or by emailing mschenk@ccusd93.org.